Tsavorite is considered the most precious stone of the large Garnet family of gems. Prized for their rarity and beautiful green color Tsavorites are the ideal choice for January babies! 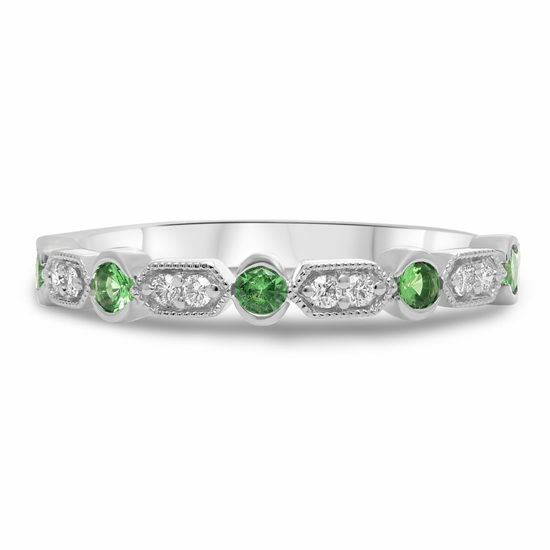 This fun 14k white gold ring contains 0.24 carats of perfectly matched round Tsavorites and 0.07 carats of diamond accents set in a milgrain edged band. Tsavorite Garnets are great for urban yogis as they are said to balance the energies between the root and crown chakras.